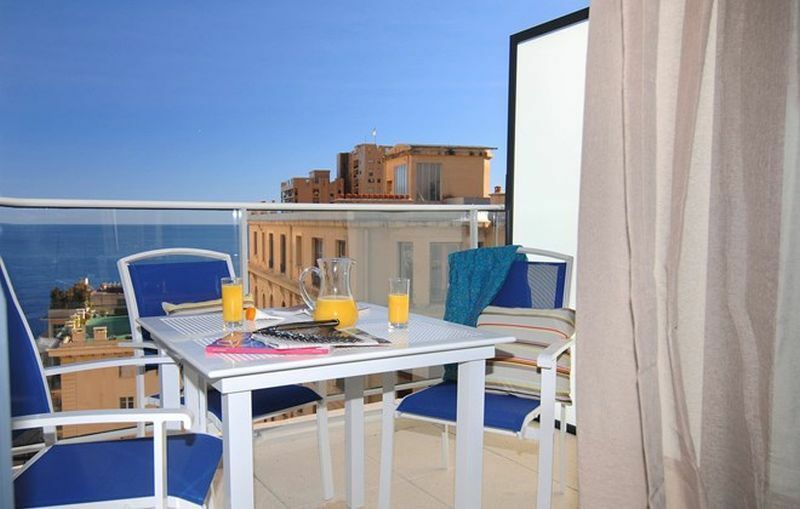 Beausoleil, the resort is known for its beautiful favorable climate, you will find on the not too steep slope at the foot of Mont des Mules, it forms a balcony overlooking Monaco and the deep blue Mediterranean. Beausoleil is located in the maritime Alpine region, only 20 minutes from Nice and 10 minutes from Monaco. It is only 30 km to the Nice Cote d'Azur airport. The name says it all, Beausoleil has an exceptionally favorable climate and is close to the beaches on the French Riviera. Your holiday environment is a special architectural area, surrounded by untouched and luxurious nature. The residence offers holiday accommodation from a studio apartment for two to an apartment with two rooms for four people. All accommodations are fully equipped, kitchen corner with fridge, ceramic hobs, microwave, dishwasher, shower room with toilet, free television, internet connection, air conditioning and a balcony. This studio accommodation is suitable for three persons (two adults and one child) and has an area of ​​31 m2. There is a living room with a double bed plus an extra bed, a fully equipped kitchen corner with fridge, ceramic hobs, microwave and dishwasher, a shower with toilet, a balcony. Bed linen and towels are provided. The apartments have satellite TV, Wifi internet connection, air conditioning. For an extra fee you can book the laundry, a covered parking space for 10 euros per day with limited number of places. You can also book the final cleaning from 60 euros depending on the accommodation. You pay extra services on arrival at the location. From the residence it is a 10-minute walk to the beach. 400 meters away you will find the shops close to Monaco. You can use the sun bed on the roof, a breakfast room with terrace, a laundry for a fee, a covered parking space with a limited amount. Bed linen and towels are provided. The apartments have satellite TV, Wifi internet and air conditioning. For an additional fee you can use the laundry, a covered parking of 11 euros per day with limited places, final cleaning from 63 euros depending on the accommodation. A deposit and tourist tax must be paid on arrival. The deposit will be returned to you on the day of departure after inventory or by post. The accommodation must be left spotlessly clean, if this is not the case, you will only receive a part of the deposit. Pets are allowed for a fee with a valid vaccination certificate and tattoo, provided they are kept on a lead at the residence. Beausoleil is a community in the maritime Alps in Southeast France. It borders Monaco. An important part of the city consists of beautiful Belle Epoque houses with overwhelming entrances. Interesting attractions are also the Gustave Eiffel, a covered market. St Joseph's monastery, a church with decorated stained glass windows and the Fontdivina fountain and bathhouse. It can be difficult to discover where Monaco starts and Beausoleil stops because the border is formed by streets and footpaths. Another attraction is the Stade Vanco, a well-groomed sports center. Places you should really see: Monaco with the casino, the exotic gardens, the oceanographic museum, beaches, the Rocher (palace and cathedral), the Louis II stadium and the Grimaldi forum with the conventions and events; Nice, there you will find the Promenade des Anglais, the old city of Nice, the Château, a tramway and more; the beauty and originality of the Riviera coast and the hinterland; Villefranche sur Mer, Saint Jean Cap Ferrat, Eze, Roquebrune Cap Martin, Menton, Sospel, Peille and Entrevaux. You can also visit Italy; Ventimiglia and the market can be found 20 minutes by car, as well as Marienland and Antibes.